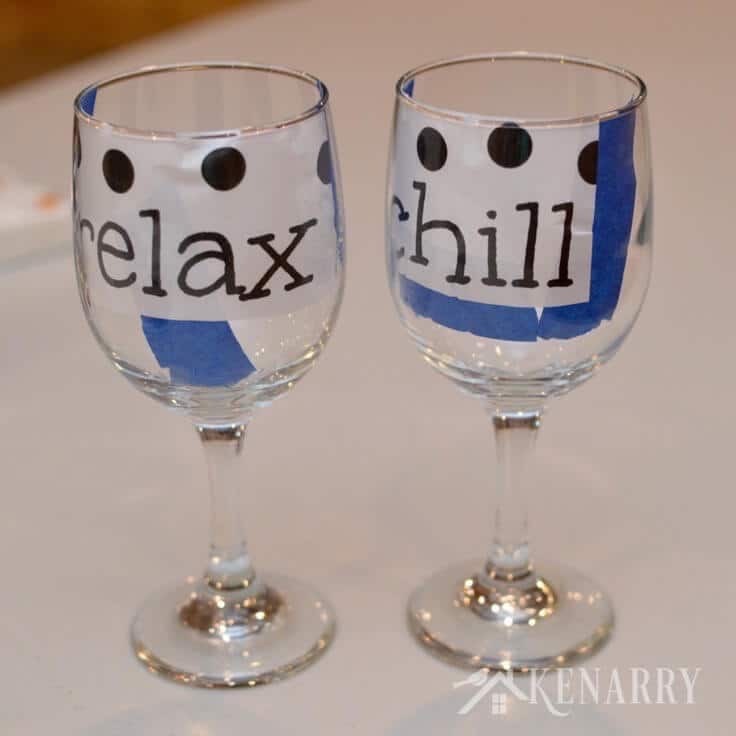 Learn how to create your own hand painted wine glasses using this step-by-step wine glass design DIY tutorial with free printable templates to make the words chill and relax. Hey there! 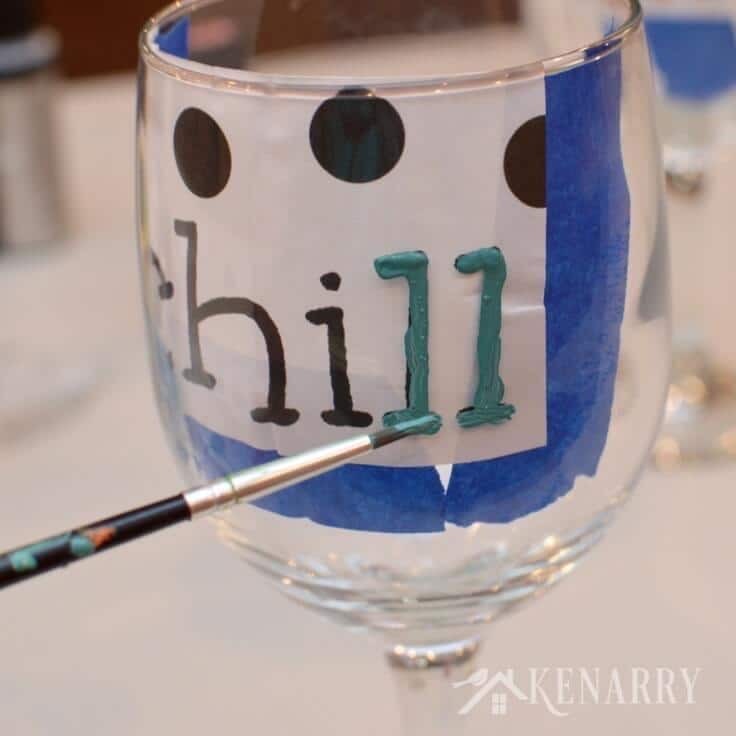 With this easy tutorial, making hand painted wine glasses will soon be your favorite craft project. I’ll show you step-by-step how easy it is to paint glassware. Earlier this year, I turned the big 4-0. To celebrate this momentous occasion, my good friends and fellow organizers of Women’s Service Day threw me a surprise party. 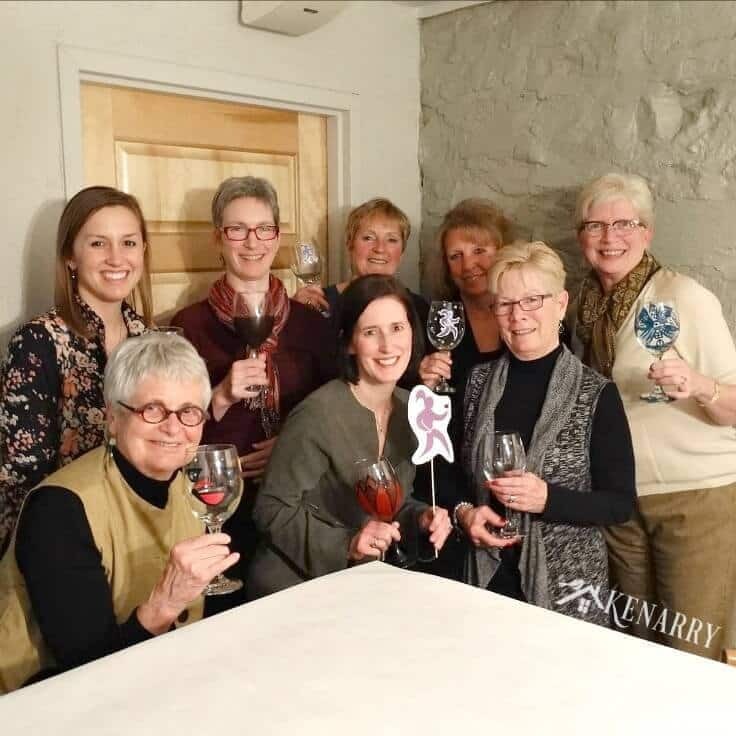 They reserved a small private wine room at a local restaurant, brought in chocolate cake, made me a scrapbook of photos from our 14 years of organizing Women’s Service Day and found so many ways to make me feel special. To top it all off, they also brought in artist Carolyn Stich to teach us how to make hand painted wine glasses. Carolyn has a studio and store in Holland, Michigan (and online!) where she sells her amazing wall art and also puts her beautiful designs on products. She also teaches art classes and workshops for kids and adults, including parties like a girls’ night out, bridal shower or other special events. Carolyn is well known in our community so I was incredibly delighted my friends brought her in to lead us in a craft night for my birthday. Crafting, wine, chocolate, and great friends — can a 40th birthday really get any better than that? Creating hand painted wine glasses is so much fun and surprisingly easy to do. Since the birthday party I painted a few more on my own which I put in a basket for a fundraiser my sister-in-law was organizing for a friend with breast cancer. Carolyn Stich kindly said I could share the technique we used at the party here on Kenarry using the hand painted wine glasses I made for the fundraiser as an example. As with any craft, the hardest part is figuring out what your design should be and what kind of paint to use on glass. I found the cutest polka dot napkins to use as my design inspiration for these wine glass designs. I wanted the hand painted wine glasses to be fun and whimsical to make them a little more light-hearted for the friend’s breast cancer fundraising event. 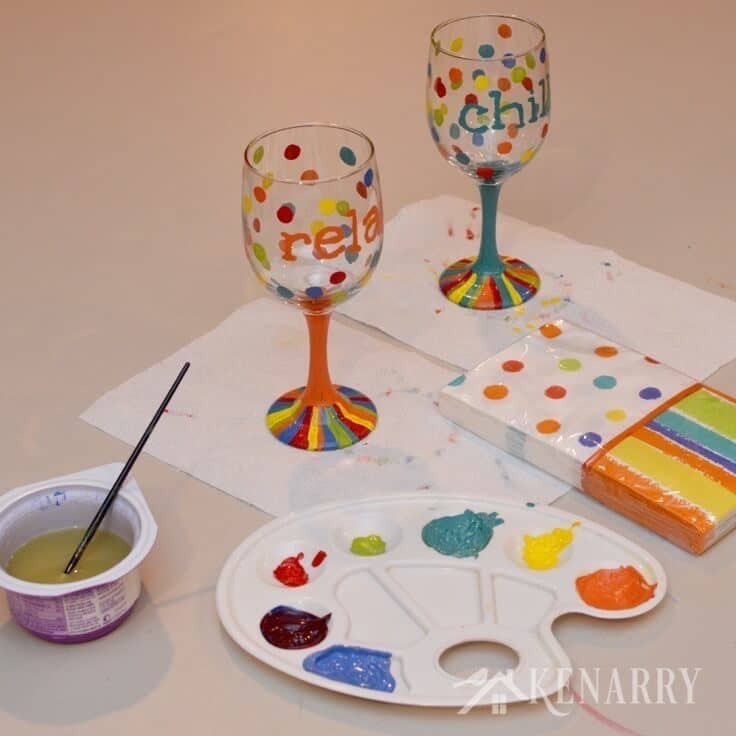 Want to know how to paint wine glasses? This tutorial will walk you through every step. Before you get started, this is what you will need. 2. Affix the design to the wine glasses. 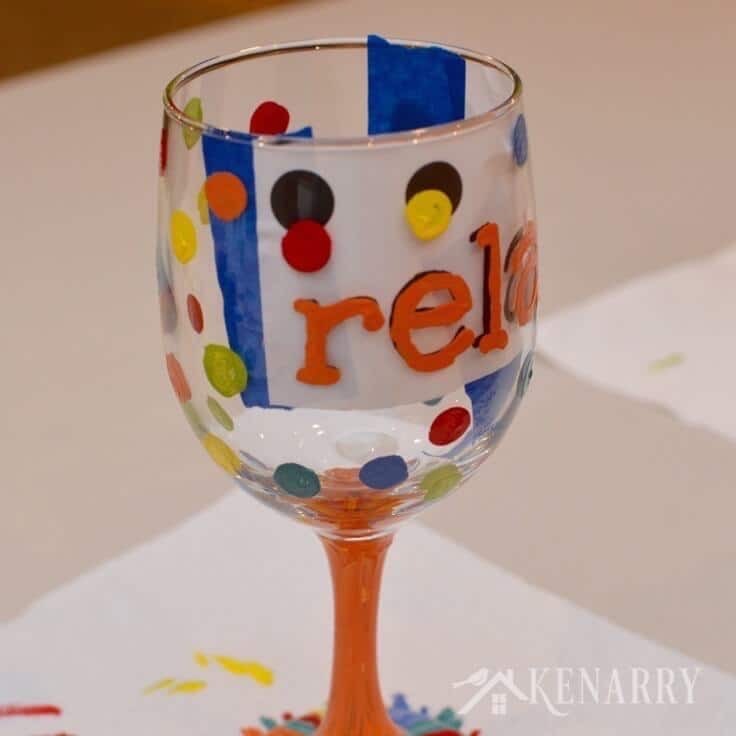 Use painter’s tape to attach your design to the inside of the wine glass. 3. Trace your design with paint. Using a small paint brush, carefully trace over your design on the outside of the glass. The design is taped to the inside so you’re not directly painting on it. You’ll see in the photo I’m using a teal or turquoise colored paint, but only listed red, yellow and blue gloss enamel craft paints for this project. With these three primary colors, you can create any color you want. Use white or black to lighten or darken your colors as desired. Gloss enamel craft paint is the best paint to use on glass. 4. Paint other embellishments. 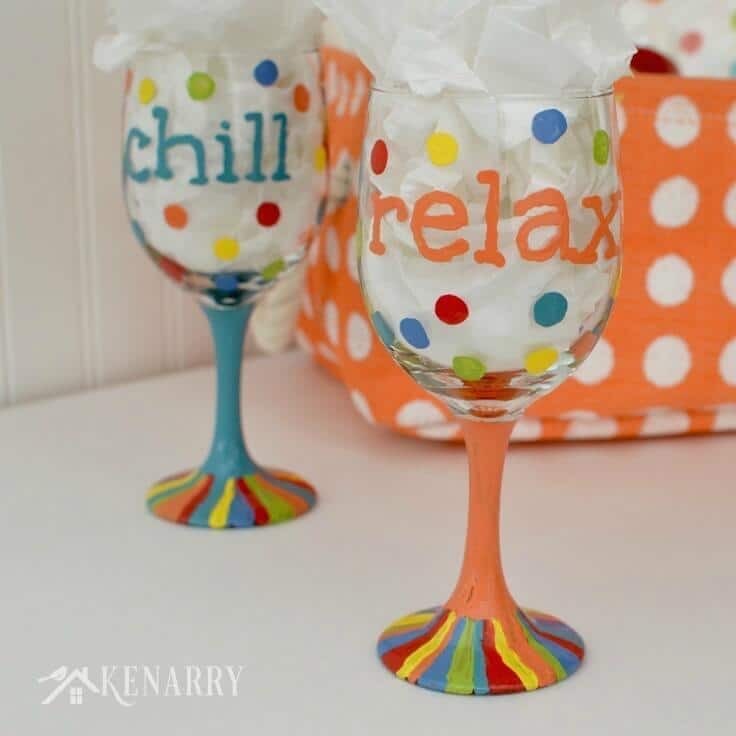 Use additional paint to add polka dots, stripes, swirls and other designs to your hand painted wine glasses. Be careful not to get the paint too close to the rim of the glass. You don’t want your mouth to come into contact with the paint when you’re enjoying wine in these glasses later. You can also paint the stem of the wine glass if you want. Allow one color to dry before painting another color next to it so your paints don’t smear together. 5. 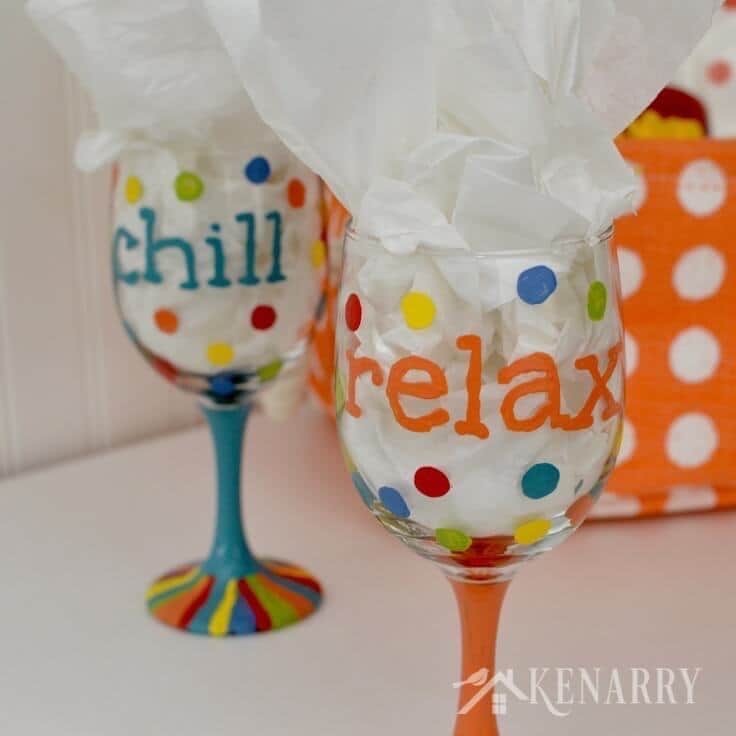 Allow your hand painted wine glasses to dry. You may need to use a few coats of paint to get the desired coverage you want on the wine glasses. 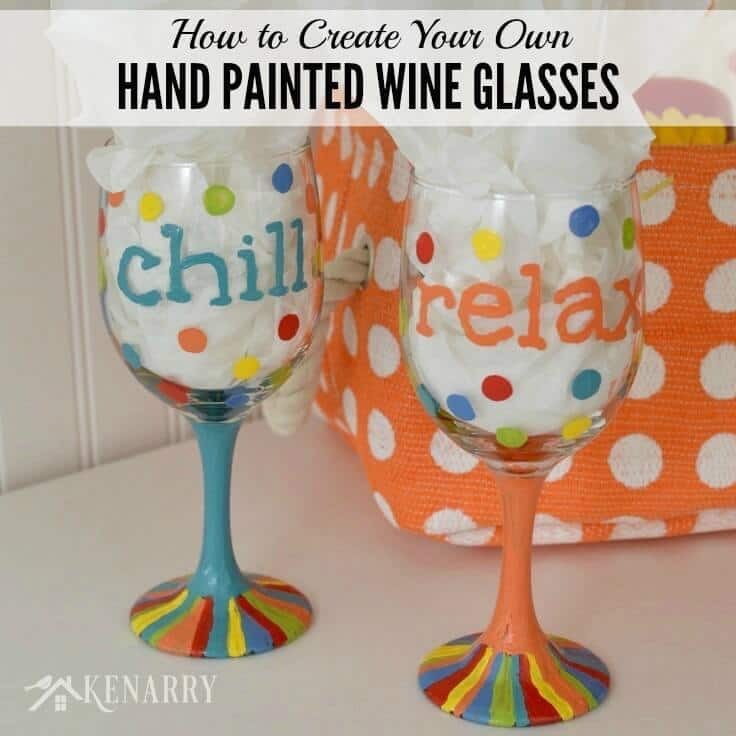 Be sure to allow enough time for your hand painted wine glasses to dry between coats. At the birthday party craft night, Carolyn taught us you can also use a blow dryer to speed up the drying process. Method 1: Air Dry. Let the hand painted wine glasses air dry for 21 days. Method 2: Bake in the Oven. Put the hand painted wine glasses on a cookie sheet and place on a low rack in the oven. Heat the oven to 350 degrees. Bake the hand painted wine glasses for 30 minutes. Turn the oven off and allow them to cool naturally with the oven before removing them. IMPORTANT: YOU MUST PUT THE HAND PAINTED WINE GLASSES IN THE OVEN BEFORE YOU TURN IT ON TO PREVENT THE GLASSES FROM BREAKING. 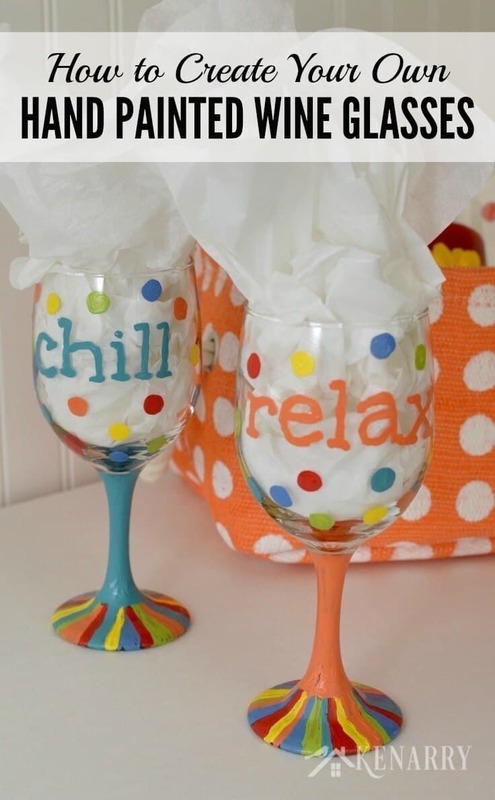 You can now relax, chill and enjoy your new hand painted wine glasses! You can also put them in a basket as a gift for a friend or raffle off at a fundraiser like I did. 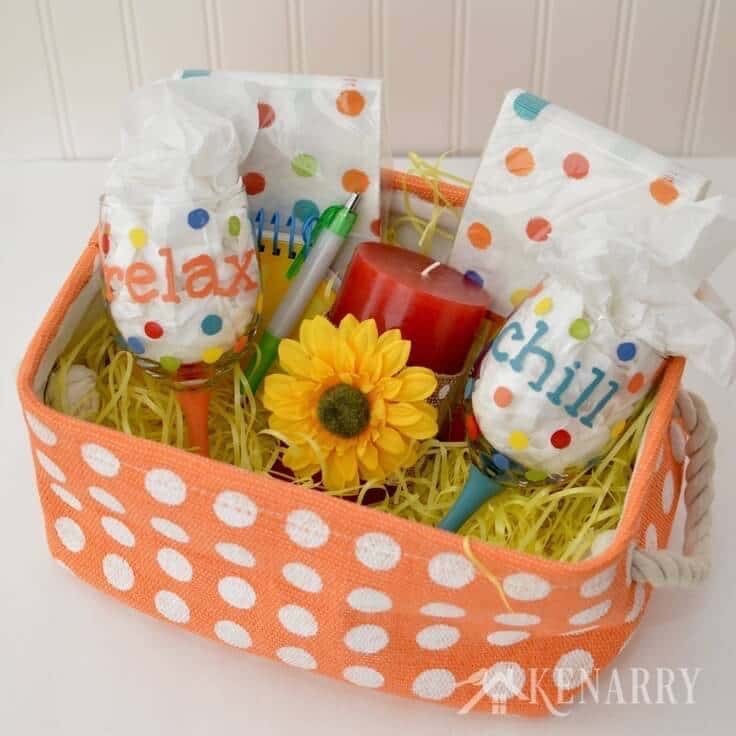 Suggestions for a gift basket include colorful napkins, a scented candle, a small notebook, and a fun pen. You can also add gourmet chocolates, a bottle of wine, and other delicious goodies! While you’re here, you may also enjoy learning how to make hand painted Easter wine glasses, how to make broken china mosaics, or how to make a burlap wreath. If you enjoyed this tutorial for how to make hand painted wine glasses, please share it with your friends or pin it for later. This Inspired Idea for Hand Painted Wine Glasses came from Carolyn Stich Studio and was shared with her permission. Please visit her website to find more great gift ideas. 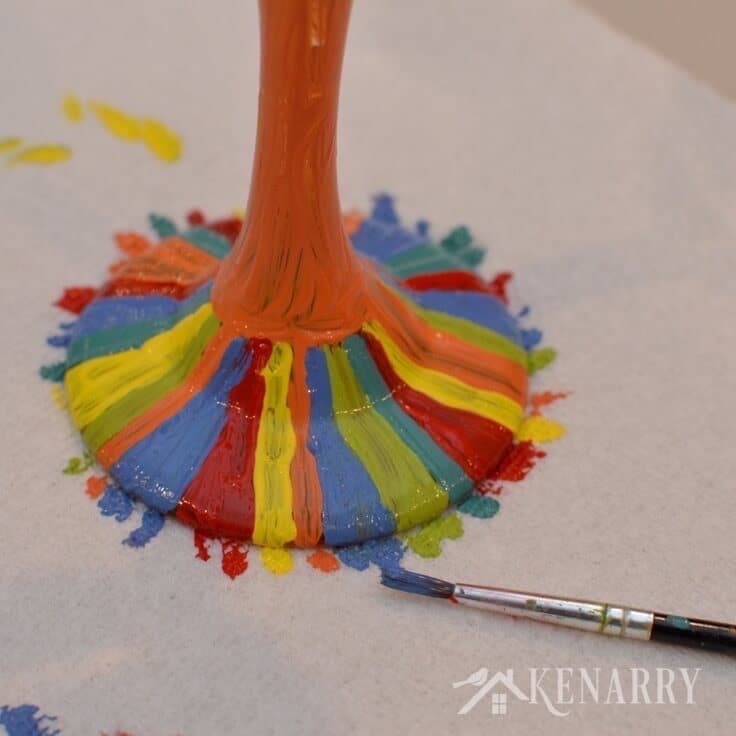 Inspired Ideas is a regular feature on Ideas for the Home by Kenarry™, sharing ideas we’ve found from other sources. The words and photos used in this post are our own, derived from our personal experience implementing this idea. If you have an Inspired Idea you’d like us to try, please contact us. Originally published September 2015. Updated September 2018. Oh my gosh, Heather! You will love it. Painting wine glasses is so much fun. You just need two per person – one for painting and one for sipping. How lovely and original! Very nice. Is there anything better than getting together with girlfriends for crafting with wine?? Now that makes for a perfect combination. Thank you for sharing on #HomeMattersParty. It really is so much fun isn’t it? We just found you had to have two sets of wine glasses though – one for drinking and one for painting! Thanks, Sonja! Such a cute idea. Thanks for sharing at the Inspiration Spotlight Pinned & shared. Can I cure glitter wine glasses the same way so that they can become top rack dishwasher safe too? Great question, Heather! If you’re referring to glitter wine glasses where you use decoupage or glue to affix small glitter crystals around the stem of a wine glass, I would NOT recommend baking those in the oven to cure it. Instead, I’d suggest using *DecoArt Americana Crystal Gloss Enamel Glitter Paint. Though I haven’t used it personally, it says you can “bake in oven for dishwasher-safe finish”. Good luck and let me know how your wine glasses turn out! I’d love to see pictures. *Disclosure: This is an affiliate link, which means if you make a purchase we’ll make a small commission at no additional cost to you so we can keep the great ideas for the home coming your way. Do you start the time in the oven when the temperature reaches 350 or before? Great question, Michelle! I put the glassware in a cold oven, start the oven and set it to 350 degrees. Once the oven reaches 350, then I start the 30 minute timer. When the 30 minutes is over, I turn the oven off and just leave the glassware inside for a few hours while the oven naturally cools back down. I usually put the glassware on a baking sheet to keep it stable on the oven racks and just in case the glass were to crack or break. But I’ve cured gloss enamel paint on glassware using this method numerous times and have never had that problem! Happy crafting! I’d love to see what you create when you’re done! You’ll need to check the side of your acrylic paint to see if it’s appropriate for use on glassware. I’ve always used gloss enamel craft paint for hand painting wine glasses, but I believe there are some multi-surface acrylic craft paints that would work as well. The side of the paint bottle will tell you whether it’s designed/formulated for use on glass. If it does not specifically mention “for use on glass” on the side of the paint bottle, I would NOT use it. Regular acrylic craft paint is likely to scratch or flake off over time and would not wash well with repeated use. I have been painting wine glasses for awhile now and have a few Enamel acrylic paints, however I mainly use craftsmart acrylic paints and apple barrel acrylic paints. The craftsmart acrylic paint I probably use most. It says permanent, water based paint perfect for ceramics, and adheres to most surfaces such as ceramic bisque. The apple barrel acrylic paint is multi surface for glass and ceramics, also water based. In door and out doors glass surfaces painted with it are top rack dishwasher safe (although I wouldn’t risk it). I always bake them for 30 minutes and depending on the design/ colors I will sometimes seal with a mod podge acrylic sealer. Great question, Gina! I tend to hand wash wine glasses that I paint as well. I do believe I’ve run ones that I’ve painted with gloss enamels through the dishwasher after the paint has cured and those have turned out just fine. I’m not sure about acrylic paint, but if the paint bottle says “top rack dishwasher safe” I’d probably try it! Just make sure the paint has fully cured first though! How much paint do you think you would need for each person? I am thinking of doing this with a group of up to 12 people. Just want to make sure i buy enough paint without over doing it. Great question, Cheryl! It’s difficult to estimate exactly how much paint you’ll need. I will say that a little goes a long way – and it all depends on what colors/designs each person is making on their glassware. If you buy red, blue, yellow, white and black gloss enamel paints, they can be mixed to create any color your friends want. In which case, I’d buy a few of each, but just open them as you use them so you can return any unopened paints after your craft party. You may also want to have gold, silver or bronze metallic gloss enamels to add some fun dimension to the glassware if people choose. You can use plastic plates or egg cartons as your paint palettes for mixing. I’d also recommend having a few old blow dryers on hand. Those can be used to help dry the paint between layers during your party. Have fun and enjoy! It’s going to be so much fun! Correction-the Joanns paitn set is NET 1 oz. So it is $3 for 1 ounce … which is .125 ounces of each color. Oh wow! And they’re gloss enamel paints too? That’s awesome. Those sound perfect for your painting party. Let me know how it all works out, Cheryl. It sounds like so much fun! Walmart has Folk Art 2oz bottles of Multi-surface paints. They say on them that they are dishwasher safe and work on glass. I think i will go that route. I might also give each person 2 glasses, so they can make a set. I have a few people who dont drink, so i like also get glass cups/mugs and candle holders. I will give everyone options. I LOVE these ideas for your party. The variety will be perfect. I find Walmart usually has the best selection of inexpensive glassware too. In addition to the wine glasses, I’ve painted platters, appetizer plates and even coffee mugs. Have so much fun with your friends! What size or “type” of wine glass did you use? Great question, Cheryl! 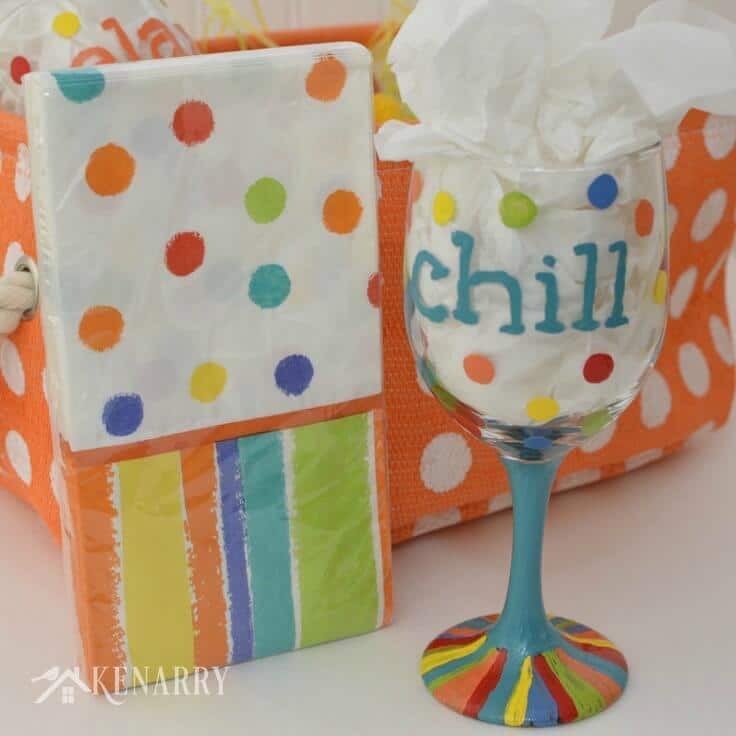 You can hand paint just about any size or type of wine glass that you’d like. For this particular post, I just used standard white wine glasses, like you’d find at Walmart, Target or Amazon. I usually look for ones that are dishwasher safe, inexpensive and not fancy. Carrie, I just finished painting 8 wine glasses and was looking for the instructions for using oven. in FL for about 25 years. Once a Hollander, always a Hollander. Oh Mary, that’s so fun! I’m thrilled you found us. I hope your wine glasses turned out beautifully. If you haven’t been to Holland lately, you ought to come to Michigan to see it – the city has changed so much, especially the downtown area.